The nature of the vibration that occurs at any particular point can be very complex and will likely be composed of many different wave types. These waves travel in and along the surface of the earth. The speed at which they travel is called the propagation velocity. The propagation velocity is typically many thousands of meters (feet) per second. 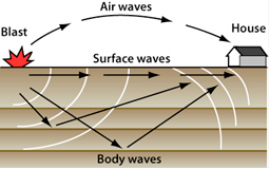 The types of waves that are generated can be classified as either body or surface. As the name implies, body waves travel primarily through the Earth’s interior. Surface waves, as their name implies, travel along the surface of the Earth. Body waves travel the fastest (up to 25,000 ft/s) and arrive first at structures. Surface waves travel slower than body waves and arrive later.